Marble look Cambria Ella Countertop blows the breeze of ancient era to kitchen remodeling: Non-demanding, low maintenance countertop selection is being easy. Cambria Ella comes from the same line of Cambria Marble Look Quartz Collection. Her other sisters are Cambria Brittanicca, Cambria Swanbridge, Cambria Weybourne, and Cambria Torquay. She always competes with White Carrara Marble and sometimes some rivalry happens. To reduce this jealousy, it is good to know that Cambria Ella Countertop has low maintenance with the same soft vein in bold cold tones like gray or blue as like as White Carrara Marble. Both have linear looking tiny veins. For my opinion Marble look Cambria Ella Countertop is a good match for white, light gray, dark gray, blue, basalt gray, walnut and chestnut cabinets. She gives a positive vibe while two tone cabinets kitchen remodeling ideas are used. At the same time, she is a good addition for two tone countertop kitchen remodeling ideas. As like as her other sisters, she may be a good addition for your wall tiling and wall covering which is sometimes called full high backsplash. She is good with any backsplash selection of white, gray and cream tones. She is a raising star in no maintenance countertops category. My picks for your reviews are waiting for you, hope you like them and share your comments with me. Since Cambria Ella is new in the market, it was not easy to reach many pictures. Please help me to make an online kitchen remodeling ideas library. . Please do not hesitate to share your own pictures of Marble Look Cambria Ella Countertop. 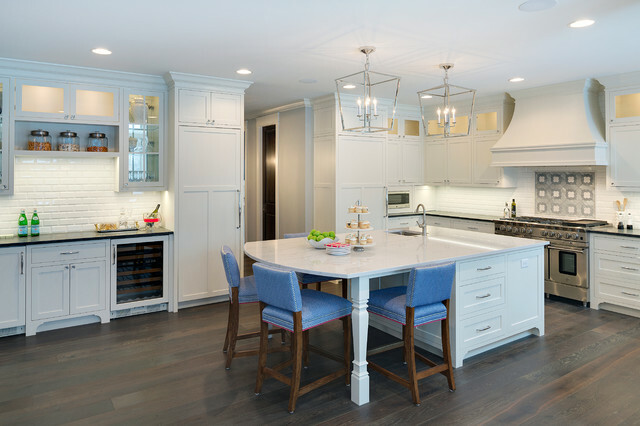 Picture Credit: Kitchen Tune-Up via Houzz., Stunning kitchen design with warm white finish white cabinets and dark hardwood flooring.Glass Door White cabinets and inside lighting seems pretty sophisticated. Big families need more space to spent time in the kitchen. So, the large Cambria Ella Island Top is addressed well. Picture Credit: Cambria, Cobalt Gray Kitchen Cabinets and Natural Bamboo Kitchen Cabinets with Cambria Ella Waterfall Edge Island Top. Natural Hickory flooring and ample day lighting adds some luxury to this two tone cabinets contemporary kitchen. Elegant…. Picture Credit: Stone Center.,Marble Look Cambria Ella Countertop and Cambria Ella Islandtop in Contemporary White Kitchen. Contrast colors are placed very well, gray kitchen appliance and red oak harwood flooring pops the beauty of engineered stone Cambria Ella. Neat looking design. Picture Credit:Grace Hill Design., Gordon James Construction and Spacecrafting Photography. Hats off design in traditional kitchen style. Such an excellent example to show the two tone countertop white kitchen ideas. Island top is Cambria Ella Countertop, perimeter is Honed Absolute Black Granite which gives an appearance of charcoal gray. Dark gray and white needs some transition color , so the flooring selection completes the total look. Tavern oak hardwood flooring is picked for the project. I think this is also honed finished. The backsplash is a dimensional white subway tile with a marble mosaic accent over the cooktop. Benjamin Moore #1472 Silver Chain wall color is very popular while combining with the white cabinets . The cabinet and trim color is also Benjamin Moore White Dove #OC-17. Special Thanks to Grace Hill Design, to share all the details.